Global Leaders Program participants engage in a team-building activity. With its young upbeat staff and office decorated much like the dorm room of a socially conscious, world-traveling, leadership-savvy student, it’s a wonder that the high schoolers who visit the home of the Illinois Tech Global Leaders Program (GLP) can tear themselves away from its comfortable red couch and fake fur pillows. But the high school sophomores who have been accepted into the two-year program do eventually leave, and in an especially grand manner: an impressive 100 percent have matriculated at universities and colleges across the country since the program’s inception. Established in 2011 (as the former IIT Boeing Scholars Academy) the academic-enrichment program accepts 50–60 Chicago-area high school students each spring. 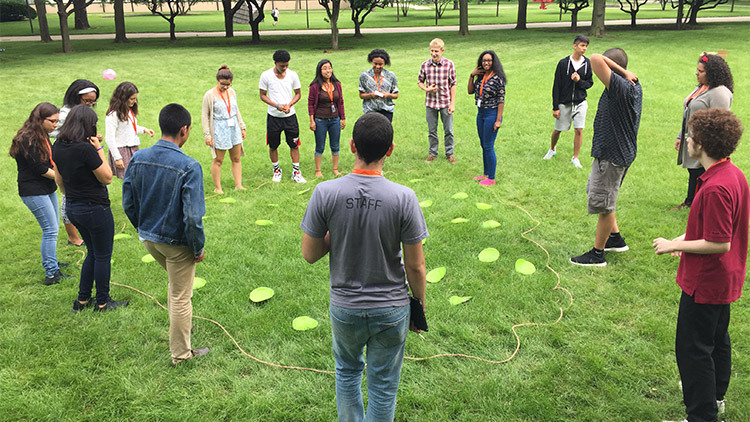 In the program’s summer session, students participate in team-building exercises, learn basic leadership skills, and are put into small groups that begin working with external partners on client projects. A popular past project, for example, was to design an enrichment toy for sea otters at Chicago’s Shedd Aquarium. Students advance to developing Community Innovation Projects during the school year, identifying a problem they want to solve within their own communities and implementing one or more solutions. A cluster of juniors in the GLP, Chitwood says, has “really gone above and beyond” expectations by presenting their project at numerous events in both Cook County and DuPage County. The group, United Innovators (UI), aims to introduce more underrepresented youth to STEM and provide them with valuable resources to further their interest in STEM fields. Since late last year the cluster has participated in four large-scale academic events, including the third annual Bronzeville Youth 360 Summit and the DuPage Area STEM Expo 2017, and created and hosted the United Innovators STEM Expo at Illinois Tech in April to benefit local-area students. Arciniega notes that UI is partnering with the Hyde Park Neighborhood Club to hold a STEM program throughout the summer for elementary school students. Inspired by their successes, the IU team is looking into the legal process to become a nonprofit organization. Recognized by the MENTOR Illinois youth-mentoring organization as runner-up for its 2017 IMPACT Award, the Global Leaders Program continues to gain recognition for helping to shape in-demand STEM achievers. The number of colleges and universities from across the country that have applied to participate in a summer college fair co-hosted by GLP, Chicago Scholars, and the University of Chicago Collegiate Scholars Program has more than doubled—from 60 to 150—over the past couple of years, requiring the event to move into the expansive University of Illinois at Chicago Forum. At its current pace of growth, the GLP team will be adding more colorful push pins to its office’s large world map indicating the many academic institutions where the program’s scholars have matriculated.